Betar together with several other Jewish organisations held a rally in Central London today to show support for Israel and her war of self defence against Hamas terrorists in Gaza. Police estimated attendance at 35,000 people. Betar supports Israel's fight against Hamas and believes that only by bringing about the downfall of the Iranian-sponsored organisation will there be a chance of peace for the people of Israel's Southern regions. The people of southern Israel have suffered under Arab rocket fire for nearly 8 years and this has intensifed within recent weeks- putting nearly 1 million Israelis under siege. Betar notes that the growth of the terror state in Gaza, popularly known as Hamastan is a direct result of the non-Zionist governmnents of the Israeli Left surrender of Land to Arab terrorists. The current war is a proof of the failure of the misguided Land for peace policy whereby the land of Israel was handed over to buy favour with Arab terrorists in Gaza. The destruction of the Jewish villages and towns in Gush Katif and their surrender to the Arab enemy by the Kadima Govenerment was a mistake of historic porportions that only the willfully blind could still defend. Betar believes in a 23 state solution with Israel from Sinai to the Golan, from the Jordan to the Mediterranean for the Hebrew people as one state and with the 22 states- members of the Arab league- as the natural homeland for the Arab populations. Betar opposes the creation of any Arab state in the Land of Israel and all those who cherish peace in the Middle East should be opposed to such failed policies. Betar views with alarm the growing danger of the Fascist regime in Iran and will lead the campaign in Britain against the terorist state. Betar UK calls on the Britsh Government to re-call her ambassador from Iran and calls on EU nations to work to topple the terror-sponsoring regime in Tehran. Betar will hold rallies across Britain to call for an end to diplomatic relations with Iran. Watch this space. In reaction to an Arab suicide bomb in Tel Aviv that murdered 9 people, Betar set up a solidarity stall in Golders Green. Information about the attack was given out to the public, names and pictures of the victims were displayed and candles were lit in their memory. Betar holds Solidarity Rally for Gush Katif. 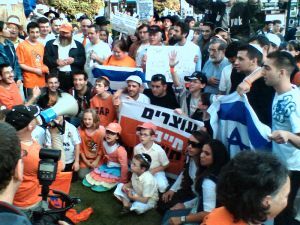 Betar held a Solidarity Rally for Gush Katif. Some 300 people took part Monday evening in a London demonstration and march to protest the rewarding of terrorism by the expulsion of Israelis from their homes in Gaza and Samaria. Psalms were recited at the gathering at Golders Green Station in North West London's most populous Jewish district. down Golders Green Road emblazoned with the orange shirts, caps and ribbons which have become synonymous with the settlers' struggle in Israel. Betar-Tagar UK has returned from a long weekend spent with our colleagues in Betar France. 20 English memebers of Tagar, the student branch of Betar participated in the Shabbaton seminar where the theme was anti-semitism in Europe and the growing threat of Islamic terrorism . The trip was an opportunity to express solidarity with our French brothers who have felt the brunt of anti-semitic acts in Europe in recent years and to exchange ideas between the two groups. The Betarim were adressed by Olivier Rafowicz, the former spokesperson for the Israel defense forces who emigrated to Israel from France twenty years ago. The Gaza expulsion plan was debated, as well as Israel's place in the media, and despite Mr. Rafowicz atempts to defend the current policy the Betarim argued vigorously against the expulsion plan and pointed to the inconsistencies, dangers and fallacies that the plan represents. The French Betarim discussed with their English counterparts different forms of activism whether to comabt growing anti-semitism or to show solidarity with Israel and were particularly impressed to hear about by Betar -Tagar UK's weekly rally and expressed a desire to come and visit to see them first-hand. The trip concluded with a tour through the historic Jewish Quarter of the city- Le Marais, before heading back to London. We are in the planning stages of future exchanges with our French colleagues - so watch this space! It is a tradition in Betar to celebrate the magnificant triamph of Bar-Kochba and his men over the Romans 1900 years ago. Betar celebrates with style! This year 40 Betarim got together to feast on burgers, hot dogs, kebabs, chicken, pita, salad, and houmus -all strictly Kosher of course! The Betarim remembered the glorious triumph of Shimon Bar Kochba- against all the odds and the restoration of Jewish sovereignty to the Land of Israel- albeit temporarily- after the fall of the Second Temple. Betar has initiated a campaign to help our brothers in Erets Yisrael facing expulsion by the Leftist government. Betar believes in the inalienable right of Jews to live in any part of their historic homeland in the Land of Israel and sees attempts to remove Jews from their homes as both illegal and dangerous. Peace will only be achieved when the Arab world relinquishes violence and terror and recognises the Jewish people's right to its tiny homeland. It will not be obtained thorugh surrender of any part of the homeland or through bribing the terrorists. The youth of Betar is loyal to the ideas and philosphies of Jabotinsky and rejects the expulsion plan and the surrender which go against, logic, relapolitik and the values of national dignity. True Zionism means being a free nation that acts with the interests of the Jewish people at heart and does not cave into threats from agressors and does not reward the enemy. The current actions of those who purtain to represent the "Likud" are in total contravention of the ideals of Zionism and typical of a ghetto mentality of fear and bribery. My name is Merav Maymon and I am the new shelicha (emissary from Israel) of the Betar-Tagar Zionist youth movement. I arrived in Britain in early November of this year and after a quick handover period, have begun to bring together the movement�s activities working closely with the Betar-Tagar committee in our Willesden offices and coordinating with the wider Jewish community. Betar has a long tradition of Jewish and Zionist education as well as activism on behalf of Israel and it is my desire to continue, as well as build on, its previous successes. I am 23 and originally from Bnei-Brak, Israel. After university, where I studied economics and logistics , I gained work experience both in the Herut movement as well as in educational projects within my community. While I grew up in the Bnei Akiva, movement and have even been a madricha (youth leader) back in Israel, I am close to the ideology of Betar having read the ideas of our founder Jabotinsky and having been inspired by the ideas of activism and the principles of Jewish self-respect. Whilst here I would be keen to work together with other Jewish youth groups that also share similar ideals of Zionism as well as Pluralism and love for the Jewish people. I see the most important goal that I wish to achieve while here is that of educating the Jewish youth about Israel and the Zionist dream. One of the ways I believe that this aim will be best achieved is through sending youth, from those in their early teens to students, on trips to Israel itself where they will be able to get the necessary first hand experience of the Jewish state and be better able to connect with their heritage. It is for this reason indeed, that Tagar will be running a small Winter Israel Tour this year that will be held in conjunction with Tagar USA and Betar-Tagar Israel, and we are already designing a larger Summer Tour for the post-GCSE, 16 year-old age category. We are also in the planning stages of several social activities that will kick start the New Year building on previous camps, speaker events and our famous barbecues as well as organising fun get-togethers for the Betarim! Betar will of course carry on with its activist role on behalf of Israel and the Hebrew nation and will continue to lend its support to the �Buy Israeli goods campaign� continuing our weekly Israel solidarity vigil in Oxford Street. We will ceaselessly maintain our commitment to campaign for important Jewish causes whether it be the Free Jonathan Pollard campaign or efforts to help our brothers settling the land of Israel. Jonny Skolnick has been appointed adviser to Betar-Tagar on religious affairs. He will use his extensive knowledge of Jewish sources to counsel Betarim on relevant issues. SHIMON IS GOING BACK TO ISRAEL - HE WILL BE MISSED !!! Below is his message to everyone..
After two and a half years of working for Betar -Tagar promoting, Israel, Zionism and Aliya, my wife and I are going back to Israel. It was wonderful knowing you all and witnessing the unbreakable ties between Diaspora Jews and Israel. Congratulations to Shimon and Renana Shamila on their recent marraige. The happy couple were married in Kibbutz Mishmar HaNegev, Israel on the 30th March 2004. Betar Tagar together with the Jewish Agency held an Israel exhibition at the Sobell Centre, Golders Green. The exhibition included art Judaica from Israel, the Israeli Tourist office, Israeli Embassy, JNF, Zionist Federation, WIZO, The Zionist Standard, and a live demonstration of Krav Maga. 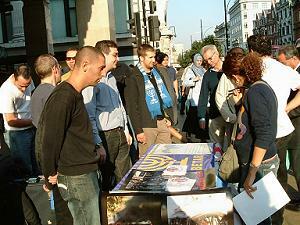 The exhibition also included information about voluntary programmes in Israel. It was attended by 200 people who enjoyed free falafel and entertainment. Betar/Tagar UK sent 25 of its members on a two-day educational trip to Holland. 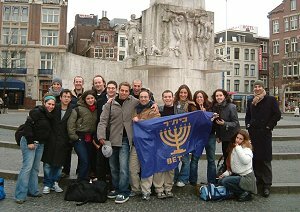 The first day of the trip included a visit to the Anne Frank museum, the Spanish Portuguese synagogue and the Jewish museum in Amsterdam. On the second day Betar members joined the 1000 youth movement members and students from all around the world who came to show solidarity for Israel in front of the international Supreme Court in Hague. Jewish agency Shaliach Shimon Shamila said �Coming here and seeing the exploded bus that Zaka brought over from Israel was an important educational experience for our members. Seeing the evidence of such an atrocity with your own eyes is worth a thousand words. I was very surprised to learn that the only other organization to send a delegation was the Zionist federation. I do believe that British Jewry should have had more representation. On Thursday September 4th 2003 Betar-Tagar held a �buy Israeli products� stand outside of Marble Arch Marks & Spencer, Oxford Street. Both Betar-Tagar and Palestinian activists held countering stands. Pro Palestinian activists have held regular protests urging customers not to shop at the high street chain because of its sympathies to Israel. Betar-Tagar distributed leaflets explaining why British-Israeli trade relations are of vital importance to the peace process, and an Israel fact sheet. Passer byes and M&S customer were very receptive to Betar-Tagar�s presence acknowledging that Israel�s case has been under represented and should be made known. Betar-Tagar Shaliach Shimon Shamila commented, �it is important to inform the general public that a boycott of Israeli goods would be damaging to Israeli Arabs and Palestinians too. Boycotting Israel does not help bring peace or stability to either side of the peace process�. Betar-Tagar plans to continue its presence outside of M&S for the foreseeable future. 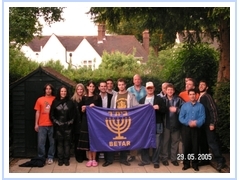 On July 27th 2003 Betar UK and Mered held a Photo Exhibition at Hendon Synagogue, Raleigh Close between 11:00 and 20:00. 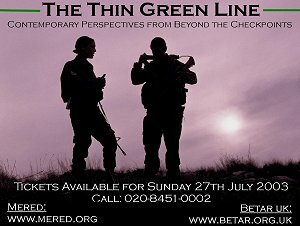 The Exhibition was entitled "The Thin Green Line". The Photographs were taken in Israel by British Photographer Toby Cohen. 22 of the pictures were displayed at the exhibition. Toby Cohen followed an Israeli platoon and documented their experiences through his photographs. Betar and Mered were proud to exhibit them. The exhibition also had computer presentations and exclusive video footage. Over 300 people attended the exhibition. Their response was very positive. Many community leaders informed us that they were impressed by the exhibition. Following the exhibitions success we will hold another exhibition in the near future. 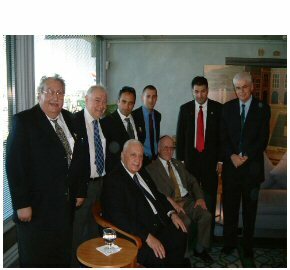 On Sunday 13th July Prime Minister Ariel Sharon met with representatives from Betar-Tagar UK and Likud-Herut GB. Ariel Sharon was greeted with words of support. He was also presented the latested edition of The Promised Land, the official publication of Betar-Tagar UK. Prime Minister Sharon visited the UK for talks with Downing Street to discuss a number of issues such as the �road map� and Bitish-Israel relations. Sharon left Britain on Wednesday headed for Norway to continue his diplomatic visit of Europe. This is a worthwhile on-line petition to sign. It asks the United Nations to treat suicide bombings as war crimes and that their perpetrators be prosecuted by the International War Crimes Tribunal. They are trying to accumulate 1 million signatures for this petition. Click on the following and please take 10 seconds to sign.